It’s probably not the study hall you remember from school, but these “Study-On-Your-Own” lessons are sure to make a difference in your success as a leader and workplace contributor. 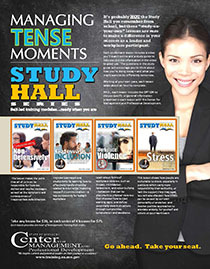 Each Study Hall lesson will include a brief introductory message from the Center for Management and Professional Development (Center), a learning video you’ll watch online using your desktop computer, and a study guide to help you put the information in the video to good use. The content in the study guide will encourage you to think about what’s working for you today—and what you might want to do differently tomorrow. Working at your own pace, each lesson will take about one hour to complete. Every lesson will include the option to discuss activities or information you read in the study guide with a Center consultant. It’s a great way to receive one-on-one feedback about how you intend to use the information in each lesson if you want it. Chose from lessons in two different SERIES. You can take any lesson for $20, or all four for $75. Each lesson provides one hour of Management Training Rule credit. Go ahead. Take your seat. You can enroll online for any Study Hall Series lesson—or all four lessons—through our Online Enrollment Form. Just select the option you want from the drop-down list, complete the rest of the form, and click “submit.” As soon as we process your enrollment, you will receive an email confirmation with instructions on how to access the lesson/s you selected. 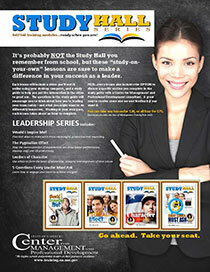 Each Study Hall Series lesson is hosted on a Moodle platform. For State employees, this is also tied to Active Directory. Consequently, once a State employee has been enrolled in a lesson, the employee will use the same Username and Password used to login to their computer each day to access the platform. All Study Hall Series lessons are designed (and sold) to be used by one person to view from his/her desktop computer. Each person who enrolls in a Study Hall Series lesson is expected to use the lesson – and the learning content – as it is intended. Allowing someone else to use or view content from the Study Hall Series who did not enroll in, or paid a fee to access the lesson is prohibited.